The body of Christ, though it has many parts, is one. So we never really read the Scriptures on our own but with the rest of the Church. We read with the Church as it has existed through the centuries, as well as with local church community we are part of today. If we think of ourselves as though we were alone on some little desert island, reading the Scriptures by ourselves, we are in danger of becoming our own little cult. But reading the Scriptures together with the Church, as it is found in all times and places throughout history, can keep us from falling into that trap. The Greek word for “delivered” is paradidomi and refers to what has been given into the hands of another — that is, handed down. That is exactly what tradition is, something that has been handed down. 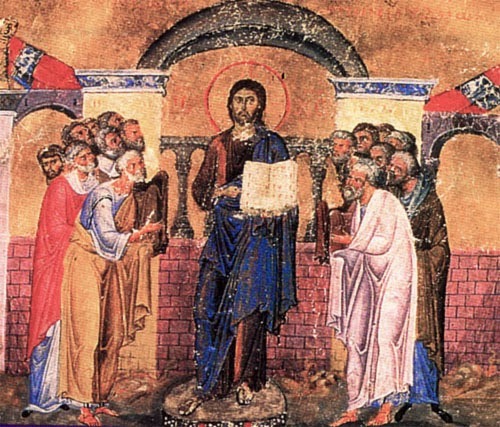 The Latin translation of paradidomi in Jude 3 is traditae, which is where we get our English word “tradition.” The faith that Jude had in mind was the teaching that was handed down from the apostles. That tradition of apostolic teaching is preserved for us in the Scriptures. Over time, the Church’s understanding of that tradition developed as Christians continued to explore what it means and how to explain it for their generations. In the first few centuries, for example, the Church was not altogether clear about how to talk about the relationship of the Father, Son and Holy Spirit, or about how the humanity of the Lord Jesus relates to His divinity. It was not until the AD 4th century that the Church came together and articulated some important understandings about these things. These conclusions were based on the Scriptures but also on the tradition of how the Church understood the Scriptures from the beginning. This means that, although the elements concerning the Trinity have always been present in Scripture, we can now identify them more easily and see how Scripture supports the doctrine of the Trinity, because the early Church Fathers labored diligently to help us understand what was handed down from the beginning. Could we have figured it all out on our own? Perhaps. However, I am not confident that we would have. So I am thankful for the tradition that has brought it out clearly for us. We should each read the Scriptures for ourselves, of course, but the truth is that we never read the them by ourselves. First, we have the Holy Spirit with us to illuminate the Scriptures to us. But God has also given us the rest of the body of Christ, to read the Scriptures together with us. That body, the Church, has been reading the Scriptures for the past 2,000 years — long before you and I arrived on the scene — and our own reading of the Scriptures today has largely been shaped by how the Church has understood them from the beginning. Of course, we are each bound to follow our conscience and convictions. That, too, has been always been an important value in the Church. However, it is not only individual conscience and conviction that is important but also the sensus fidelium, the “sense of the faithful” — how the body of Christ as a whole has read the Scriptures and understood the Christian faith. Though it is possible that God may use the conscience and convictions of one to correct the understanding of everyone else, it is more likely that God uses the sensus fidelium, the convictions of the body of Christ as a whole, to help guide the understanding of the individual. Each individual believer has the Holy Spirit who teaches us, but the Holy Spirit often works through means, and one of those means is the gift of teachers He has given to the Church. So, although we are obliged to follow what we believe to be the leading and enlightenment of the Holy Spirit, we do well to pay attention to how the rest of the body of Christ has understood the Scriptures and the Christian faith. It is wisdom to consider carefully how the Church in the early centuries read and understood and talked about the Word in its own context, as well as how later generations read and understood and talked about the Word in their own contexts. It is all part of the larger conversation that has brought the Church, and us with it, to where we are today in our little piece of the conversation, and it will help us understand and talk about the Word in our own contexts. When we, as part of the body of Christ, do theology or read and interpret the Scriptures, we are always in conversation with tradition. It is not a question of whether we need tradition. The truth is that we cannot get away from it. And I am very thankful for that — I have more confidence in the tradition of the Church that has gone before me for 2,000 years than in my own ability to figure the Christian faith out for myself. If I stray very from what the historic Christian church has long considered orthodox, I should think I had taken a wrong turn somewhere.